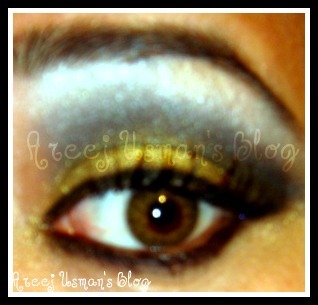 I am here today to share with you my new Eye make up that I wore to my friend’s Mehndi 2 days ago. 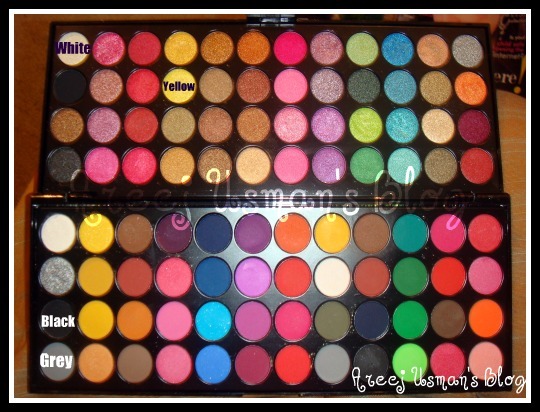 I have created it using my 48+48 Glamorous Face Palette.I would like to mention that there is a Giveaway going on & I am giving another palette away.If you have entered its great,but if you havent you are welcome to enter.It will end on the 5th of May. 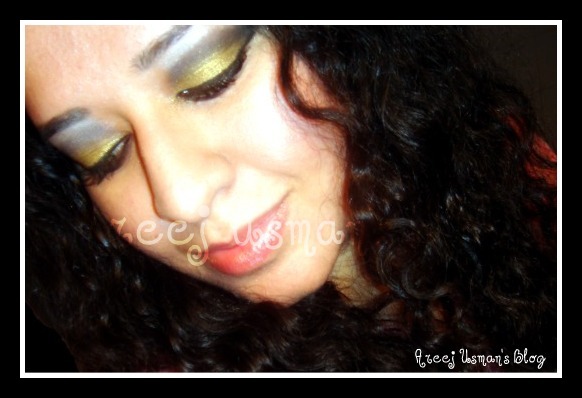 I have marked the colors that I have used in my palette.The yellow & white that I have used are from the Makhmally/Shimmery side & the Black & grey are from the Matte side.I started with applying some Artdeco eye shadow base to the whole lid area.I took Yellow shade and tapped it one the upper lid .Next some black and patted it across the above crease and the outer V.Took some more black eye shade and created a darker effect around the outer V to emphasize.Blend there together with the Yellow to create a neat look.Take some more Yellow and dab on the inner & middle lid.Now take the Highlighter color that is the shimmery white & pat along the brow bone.Added some black to the lower lash line & smudged with a smudger brush.Finished off with Maybelline Studio Gel eye liner & Lancome Hpynose drama mascara. I hope you girls enjoyed & liked it.This look can be worn to any mehndi function because it will complement any yellow orange,silver,gold colored dresses . Such a beautiful look! Thanks for sharing, I love it!